In an essay in Research Ethics, Maxine Robertson, Professor of Innovation and Organisation at Queen Mary University of London (QMUL), responds to my essay, "The case against ethics review in the social sciences," published in the same journal in 2011. I wish she had responded to more of the broader ethics-review critique and offered more details about ethics review at her own institution. Is the United States unusually bad? 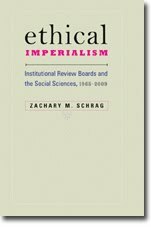 Robertson argues that I assume "that the somewhat draconian measures taken with respect to the ethical review of social science research in the US are applied equivalently elsewhere. This," she claims, "is not the case in the UK." Adam Hedgecoe made a similar claim in 2012, and I addressed it in a subsequent blog entry. Robertson knows of my blog, but it is not clear she has read that entry, or any my many entries tagged "United Kingdom. Robertson does cite Martin Tolich and Maureen H. Fitzgerald. “If Ethics Committees Were Designed for Ethnography,” Journal of Empirical Research on Human Research Ethics 1, no. 2 (June 2006): 71–78. doi:10.1525/jer.2006.1.2.71, but she does not mention that their critique is based in part on "Fitzgerald's extensive study of ethics committees in five countries (Australia, Canada, New Zealand, United Kingdom, and United States)." She also allows (in a footnote) that British researcher Irena Grugulis endured "a very unfortunate experience," and that "a range of approaches are applied in the UK and elsewhere," some of which produce "evidence of silly practice." She does not ask what mechanisms might be responsible for such conduct, or how they might be reformed. In my 2012 response to responses, I wrote, "Perhaps my final challenge to my readers should have been to find me an institution whose researchers in the social sciences and humanities broadly agree that the ethics review system is doing more good than harm, and where few scholars are outraged by the mistreatment they have received." Though apparently not familiar with the posting, Robertson has taken up the challenge, offering her own institution, Queen Mary University of London (QMUL), where Robertson both conducts research and serves on the ethics committee. She does "not claim that the process and practices that have been developed at QMUL are typical in the UK," only that " all manner of social science and humanities research can be effectively and efficiently reviewed when the emphasis throughout is placed on affording care rather than avoiding harm." I don't know what Robertson means by distinguishing between "affording care" and "avoiding harm." She goes on to describe a multi-level screening process, designed to quickly approve "low risk" projects while imposing heavy scrutiny on "research [that] is considered to be very high risk, i.e. it is generally agreed across the committee that there is the potential for actual psychological or physical harm, either to participants and/or the researcher, or the university’s reputation may be put at risk." Putting aside the question of whether the university's reputation deserves such protection, what is this but a system designed to avoid harm? Nor do I understand how an emphasis on care could be squared with the UK's Framework for Research Ethics, which states as one of its "key principles of ethical research," "Harm to research participants and researchers must be avoided in all instances," but does not use the language of affording care. Does Robertson advocate departing from the FRE? (See "Anxious Pessimism on UK's New Framework for Research Ethics." Robertson is aligned with the FRE in her wish that REC's protect not only research participants, but also research institutions. But she offers no examples of legitimate restrictions from an REC that would protect the latter but not the former. It sounds to me like an opportunity for an administrator to squelch politically unpopular research in the name of ethics. I conducted short interviews with a number of academics and doctoral students in social sciences/humanities at QMUL in writing this response, and the overwhelming message was that by engaging in and with this process, they reflected extensively on both their research design and the roles/responsibilities they had as researchers. All of those with whom I discussed the process therefore viewed the experience as contributing to their professional development. In summary, Queen Mary’s research ethics committee does not impose silly restrictions. Some scholarship offers quantitative evidence (numbers); some offers qualitative evidence (stories, quotations). The above paragraph offers neither. Two paragraphs previously, Robertson notes that "in particular research contexts it might be more appropriate to offer participants a ‘voice’ and give participants the opportunity to make that decision for themselves, provided they are given a clear explanation of how their data are going to be used." This was one of those research contexts. If things are so peachy at QMUL, why couldn't Robertson get some researchers not on the ethics committee to say so in public, to tell the stories of the ethics reviews that contributed to their professional development? For all I know, QMUL is a model of sensible ethics review. But I can't rely on Robertson's assertions, and she gives only hints at what might make QMUL different from other institutions. Finally, I will note that Robertson charges that "Schrag (perhaps not surprisingly given his own background) implies that most social science/humanities research adopts an ethnographic approach." Robertson is quite right that my essay (and my work in general) is particularly concerned with interview and ethnographic research, though I don't know how that implies that I think such methods represent "most social science/humanities research." One can be particularly concerned with the safety of bicyclists without thinking them a majority of road users. At this point, I find TCPS2's formulation, "qualitative research," to be a useful antidote to such forms as "Research in the Behavioral and Social Sciences," which led the National Academies of Sciences initially stack its committee with quantitative researchers. On the other hand, Gunsalus was onto something when she wrote of "two people talking" as a promising target of deregulation. Whether the results are to be reported qualitatively or quantitatively, prior restraint of conversations between consenting adults is a particularly severe problem.